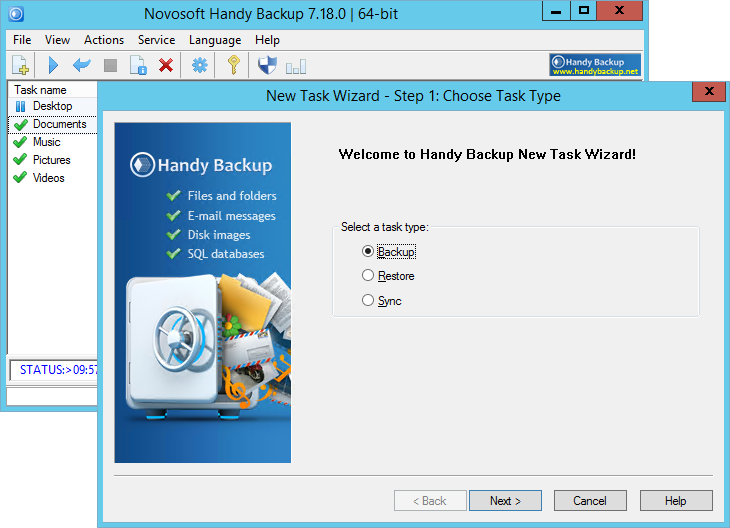 Handy Backup Small Server 7.18 contains an update for E-mail plug-in, internal compression for such apps as Hyper-V, Exchange and MSSQL, and provides a connection to server for users with empty passwords. backup, back up, software, solution, handy, small, server, database, exchange, sql, mssql, mysql, automatic, windows, hard, drive, disk, hdd, image, ftp, db2, open database, online, cloud, google drive, onedrive, files, folders Handy Backup Small Server is a full-featured backup solution for Windows Server 2016/2012/2008. Provides backup of files, HDDs, MS SQL, MS Exchange, MySQL, PostgreSQL, Oracle to local and external drives, FTP/SFTP/FTPS, WebDAV, or cloud storages.